The last three hours or so were the most fulfilling and the best cricketing action I have watched in a long while and the entire credit goes to the young girl from Moga, Harmanpreet Kaur, the vice captain of the Indian women's cricket team. Take a bow, Harmanpreet, what clean, ferocious striking of cricket ball. I had never seen such decimation of the opposition bowlers, that too of an Australian attack ever since Sehwag retired from the cricketing action. When I switched on the channel, I was so disappointed at first to see that it was raining heavily and I was apprehensive that the match could be called off. I even read a comment on ESPN Cricinfo that there was no reserve day, which was strange, considering that it was a semi final match of an ICC tournament! However fortune smiled and finally we had a match, although it was reduced to 42 overs a side. India won the toss and decided to bat first. However they lost their openers quickly. 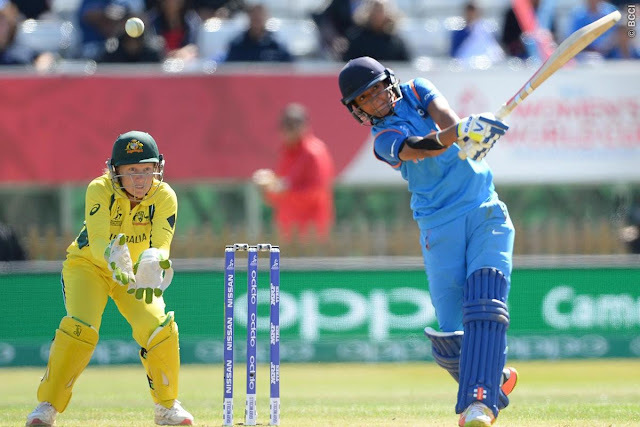 The Indian captain Mithali Raj along with Harmapreet steadied the ship but Mithali was bowled for 36 runs just when the partnership of 66 runs was going strong. Harmanpreet however had other plans. The girl single-handedly changed the course of the match and thus took the game away from the Australian team in a matter of few overs, racing to 171 in mere 115 balls. Powered by Harmanpreet's unbeaten destructive knock of 171 that was studded with 20 fours and 7 sixes, the Indian team could set Australia a mammoth target of 282 in the second semi-final match of the on going ICC Women’s World Cup 2017. What I liked the most about Harmapreet's knock was her unselfish batting, she wasn't playing for her stats or records, one could see in her eyes that she was determined to take the game far away from the Australian team. When she was on the cusp of her century, she didn't care for her it, rather she was running for the second run to retain the strike even when she was in considerable pain following some cramps or probably had pulled a hamstring. Emotions were running so high, she was so furious with her partner the young Deepti Sharma, another bright talent in the Indian team, for she could have been run out had Deepti not run for the second and dived full length. Harmanpreet didn't even celebrate her centur raising he rbat or anything, rather she flung her helmet in fury. Poor Deepti was in tears. After the century, thereafter it was all Harmanpret show, smashing 8 fours and 5 sixes in the next 25 balls! It was a dream script, Harmanpreet's knock made it possible. Otherwise to beat Australia that too in the semifinal of the world cup where they have been champions seven times was never going to be easy. The second part of the script too went India's way, the Indian bowlers bowled really well to restrict Australia to 245 runs. india won by 36 runs and made to the finals to be played at Lords, only for the second time. Hopefully the Indian team will go past the English team as well to lift the cup for the first time. That would be a glorious moment for the entire nation and would inspire thousands of girls and their parents to encourage their daughters to take up cricket.